As the name suggest, Voter ID card requires for casting your vote in order to select your leader. It is also considered as a valid proof of identity. And every Indian citizen above the age of 18 years is eligible to apply for a voter ID / election card. But, people often delay in applying for a Voter ID as it usually takes a lot of time. And earlier it was only possible to apply for a Voter card only prior to an election. However, the Election Commission of India (ECI) has made the Voter ID application process convenient by providing online application process. Online processes are the most convenient type of process as it does not require paying a visit and waiting in a long queue, one can simply complete the procedure by sitting at the comfort of their house. The online Voter’s ID registration process is extremely simple; all you need is to visit Election Commission of India (ECI). This website contains all the information and facilities one needs to know about the election process in India. 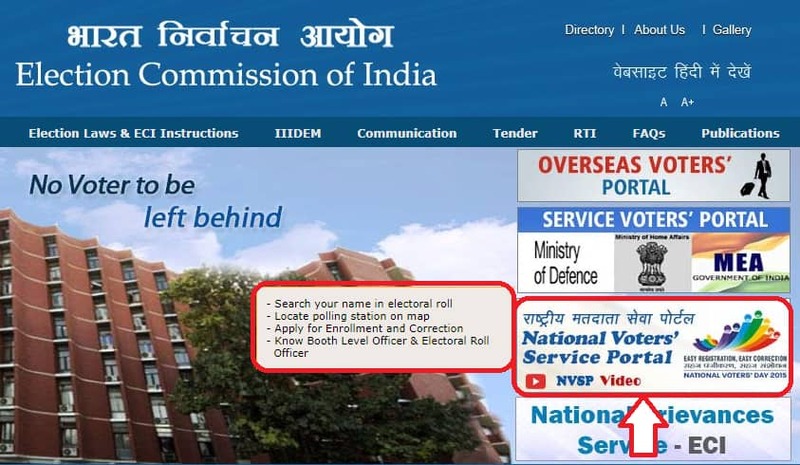 Visit the official website of Election Commission of India eci.nic.in/eci/eci.html and click on National Voters Service Portal. 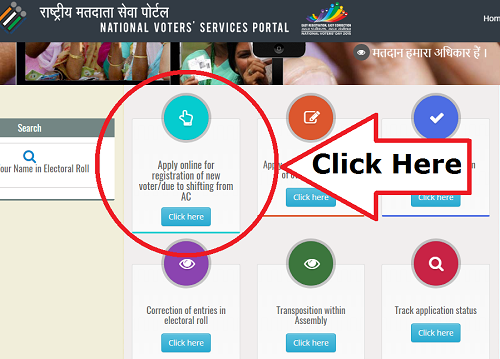 Look for “Apply online for registration of new voter“. Provide the details the site is asking for and attach the required documents and click on submit. Once submitted, you will receive an email on you registered email ID with a link attached in that mail, through which you will be able to track your Voter ID application and you should receive your Voter ID card in a month from your application. Proof of identity which includes your birth certificate, passport, driving license, PAN (Permanent Account Number) card, or high school mark sheet. There are many benefits of applying for a Voter ID online registration. One of them is you do not have to visit electoral office and wait in long queue to procure the registration form as the electoral office have introduced the online method and made the process easy and convenient. Another advantage of applying for voter’s ID card is that you can track the status of your application once you have applied. After submitting the form, you will get regular updates of your application. Unlike regular application process, online application process works faster. And most importantly once the application is submitted and verified, your Voter ID card will be delivered at your doorstep. For a Voter ID card, you require to procure Form 6, which is divided into sections. And at the beginning of the form you require to select your state you are applying for the voter ID card form and from the drop down, select your constituency. First Section – The first section of the form contains information on the applicant’s details. And you are require to fill in your name both in English and your regional language and also your gender, birth details etc. Also, fill in the name of either of your mother / father / husband / wife and mention their surnames and mention this information both in English and your regional language. Second Section – In second section you are required to fill your address particulars i.e. provide your street, locality, road or mohalla. And it is also compulsory to mention the name of your village or town. Also, enter the name of your post office in your locality. Now enter your PIC code and the tehsil / taluka or mandal or thana. After this select your district from the drop down menu. And it is optional to whether mention your email ID or your mobile phone number. Third Section – In the third section, you are required to enter the details of your family members who are already enrolled in the electoral constituency. You will have to mention the name of the person, their relationship with you, their election photo ID number, also their constituency and serial number as it appears in the electoral rolls of the constituency. And upload the supporting documents such as your photograph, address proof, and identity proof. Fourth Section – Fourth section of Form 6 is a declaration form. The declaration that confirms your citizenship who resides at the address you have provided. Which also works as a proof that you haven’t applied for a voter’s ID card in any other constituency. Once you have finished filling the form with correct details, click on “submit” button. India is one of the largest democratic countries in the world. The principle of the democracy denotes – “For the people, of the people and by the people“. The process of Voting in elections is essential for a democratic country. The elections are a way where the citizens of the country choose the ruling person and to assert their opinions. This is not only the privilege of the citizens but also is their responsibility to cast their vote in an election that is held in the constituency. But it has been seen that there are many impostors and swindlers who take the advantage of the Voter’s ignorance and engage in vote rigging. Therefore, the Government of India came up with this idea of providing separate Voter identity cards for the voters in the year 1993 and since then, the Voter ID cards have been issued to all the eligible voters. Delhi, which is known to be the democratic capital of India, the elections are conducted in accordance with the Constitution. All the eligible candidates can apply for the new Delhi Voter ID Card. The Chief Electoral Officer has introduced an Online Portal where one can perform many activities such as apply for a Voter ID, Status check and Making corrections and lot more. Visit the official website of the Chief Electoral Officer of Delhi: ceodelhi.nic.in. When you reach the homepage if you are a first time user or applicant then you can easily register yourself. For the registration process, you have to you have to enter the details like name, address, and phone number. After the successful registration, log in using the credentials. The credentials are given after the registration process. After logging in, you will be landed to a page, where you have to choose the following option- “Apply for the inclusion of name in Voter list using Form-6 online”. 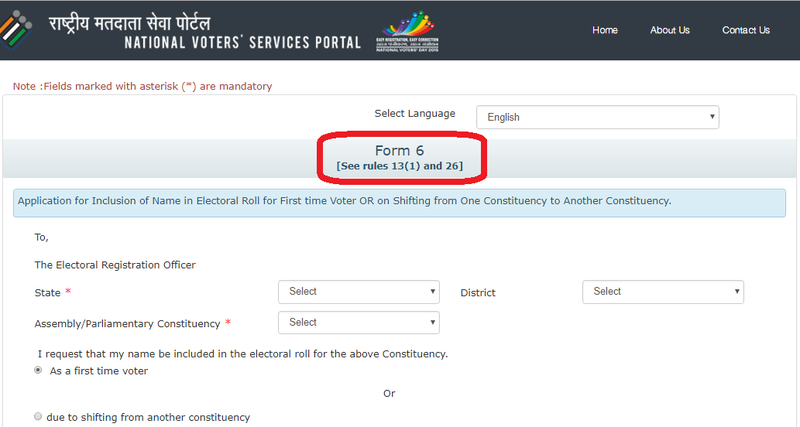 In the Form – 6, you have to enter the area, locality or the Assembly constituency number. Once it is completed you have entered the other general details such as name, surname, date of birth, and place of birth, address including taluka and district and information about the other family members whose name is already there in the electoral roll. 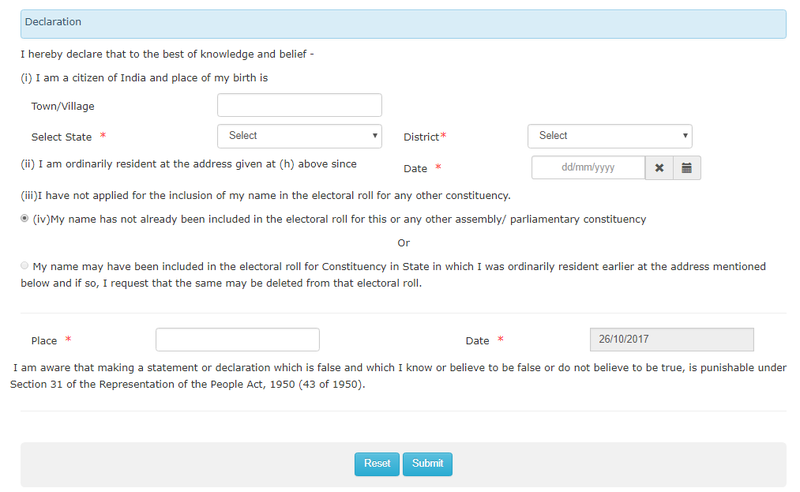 The first time users have to select the option that their name has not been included in the electoral roll of the assembly. Those who are applying for a change of address to another Assembly constituency or for the Voters who already have a Delhi Voter ID Card, but their name has not been updated in the electoral roll must select the option accordingly. An OTP will be sent to your registered mobile number and after you enter the OTP, you can preview the form and submit it. Once you submit the form, you need to attach the required supporting documents like the address proof. Identity proof, and photographs. After the review of the application, the Booth Level Officers (BLOs) will visit your residence and tally the documents and the information that you have submitted. Once they validate all your information, they move to the next level. Once all the procedures are completed and the Booth level officers give a green signal to the application of the Delhi Voter ID Card, the Voter ID will be sent to your following address. Take the Form 6 (you can either download the form from the Chief Electoral Officer or get a copy of the form from the Voter’s Registration and EPIC Center of your Assembly Constituency. Fill in the form completely with correct details and stick one passport size photo in the provided space. Attach age proof and residence proof. Now send the form along with the supporting documents via post to VREC (Voter’s Registration and EPIC Centre) of your Assembly Constituency. You can also submit the documents by visiting the VREC and deliver the documents in person. You can also submit your documents to the Booth Level Officers (BLO’s) after which they will verify the documents and the application form. Then after the verification, the Delhi Voter ID Card is sent to your residence. You can check your Delhi Voter ID Status by providing your Application ID number. Now enter the ID and the given captcha code and click on “Search” to receive the results. The following facility is currently not available in Delhi. But if you want to check whether your name is included on the Electoral Roll, then you can send an SMS to 7738299899. The ECI office Delhi provides two helpline number, one is the helpline number and the other is the call center number where the applicants can call and ask their queries like the status of the Delhi Voter ID Card etc. Call center- 1950 which is a toll-free number. It is available on all the working days between 10:00 am to 5:00 pm. If in case, your Delhi Voter ID Card is stolen, then you get a duplicate Delhi Voter ID card. But before that, you have to file a FIR in the nearest Police Station. Also if your Voter ID card is damaged or misplaced you can apply for a duplicate Voter ID card. If your Voter ID is lost or stolen or misplaced, visit the nearest Police Station and file a FIR complaint. You will need this FIR Copy while applying for a duplicate Voter ID. Also give a letter to the police station mentioning the date of loss, place of loss and Voter ID number and name. You have to fill the Form 002, which can be downloaded online. The form is attached to the FIR. Form 002 is designed by the Election Commission of India for the issuance of the Duplicate Voter ID Card or Elector’s Photo Identity Card (EPIC). Also, submit the additional KYC Documents like the age proof and the address proof. Now submit all the documents along with the Form 002 at the nearest Election Commission Office. The application is then reviewed by the Officers and if all the data and information provided is correct then the Duplicate Voter ID Card is sent to the designated address. If your Voter ID contains wrong information regarding you then you need to get it rectified as soon as possible. The wrong information can be your name, address, date of birth or photograph. You must get the incorrect information corrected soon, as the Voter ID Card serves as an Identity Card. Visit the Chief Electoral Officer website of Delhi. Log in using the credentials and if you are a first time user then you have to register on the Portal using your name, e-mail ID and phone number. Once you get logged in, then select the option “Apply for correction in particulars in Form 8 online“. The form 8 is then displayed on the screen. Before filling up the form, you need to enter the Assembly Constituency. If in case you are not sure about your Assembly Constituency then you select the same by the link provided to get narrower search. After entering the Assembly Constituency, you have to enter your name, parent’s name or spouse’s name, Voter ID number and the EPIC Number. After the above step is completed, you have to fill the Form 8 where you need to enter the other details like- name, address, information about the other family members whose name is already present in the electoral roll. Make sure that you have entered all the information correctly, that you wanted to change it in the Voter ID. Along with the application form, attach the required documents. Like for an example: if you are willing to change the photograph in the Voter ID then, you must upload a photo identity proof. Once the application form is submitted, the form and the documents are reviewed and the new corrected Voter ID is sent to your mentioned address. Take the form 8 that is issued by the Election Commission of India. This form is meant for the correction of the name, address, date of birth and photograph in the Voter ID. Mention the information that needs to be corrected and attach the required documents along with that. Like for an example: if you want to correct your spelling name then you have submitted a KYC proof that has the correct spelling. Along with the form, submit all the documents at the nearest Election Commission Office. They might also ask to present the original Voter ID copy. The application for the change of the information of the Voter ID will be then reviewed and the new card will be sent to your residence. Visit the official website of the Chief Electoral Officer and log in using the credentials. If you are a first time user then you have to register using the name, e-mail ID and phone number. A page will be displayed, where you need to select the form 8A which is meant for the change of address within the same assembly constituency or Form 6 which is meant for the change of address to another Assembly Constituency within Delhi or from another place in the country. 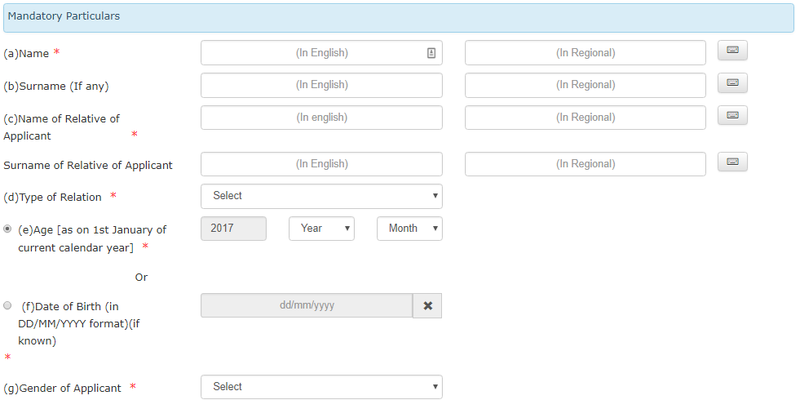 The form will be displayed on the screen and you need to provide the correct address as well as the old address. You also have to enter the EPIC number along with the other details that are asked. Also, upload the required supporting documents for the address change. Once the form is submitted, the Booth Level Officers will visit your home and confirm the details. The new Voter ID with the updated address will be sent to your current residential address. For the voters who are not familiar with the online process of applying for the change of address in the Voter ID, the election procedure. The candidate has to fill up the form and submit the required documents and submit it to get it address in the Voter ID card changed. Take the Form 8A which is meant for the correction of the address on the Voter ID. If you want to change your address to another Assembly Constituency within Delhi or from any other place in India then, select Form 6 to change the address in the Voter ID. Fill in the form correctly and attach the required documents for the new address like Ration Card or Passport. Finally, submit all the documents at the nearest Election Commission Office (ECO) in Delhi. The Election Commission Office will verify your application form and the other supporting documents and will send you the Corrected Delhi Voter ID. Thus, these are the various different Voter ID procedures that are held in Delhi. So start Voting and be a responsible citizen of India. India is a democratic country where citizens are given the right to vote and elect their leaders who will govern the country and enact policies. And all the Indian citizens who are above the age of 18 years are eligible to vote. However, to exercise this power they are required to register themselves for the electoral process. Election commission have made the Voter ID application process easier for citizens to apply for Voter ID cards or make changes in their cards. In this article, we will discuss the Voter’s ID application process of Assam. As it is an offline procedure, you will have to visit your nearest electoral office to procure Form 6 (registration form for a new voter in the electoral rolls). Fill in Form 6 with appropriate details, sign it and submit it to the electoral office along with the required documents such as proof of address, proof of age and a recent photograph. At the time of submitting the form, you will receive a reference number, which you should keep it as you will need it at the time of tracking the status of your application. After the submission of the form, a Booth Level Officer (BLO) will visit your home to verify the details you have provided. Upon successful verification, your Assam Voter ID Card will be send to you by post at the address you have provided on the form. If you want you can also collect it in person from the election office. The Chief Election Officer (ECI) of Assam has introduced an online application process which will speed up the registration process. With online application process an applicant is no longer required to stand in long queue, they can apply for their Assam Voter ID Cards at their convenient times and can also track them. Visit the official site of the Chief Election Office (ECI) of Assam and search for “Download Forms” to download the registration form and click on it, and select Form 6 (Voter’s registration form) for enrollment of new voters. Now you will get the language preference option i.e. English, Bengali or Assamese. Once you have filled the form, upload the documents the site is asking for such as proof of age, proof of address or passport size photographs. Once you have filled the form and attached the required documents, you can submit the form either by visiting the nearest election office or by post. At the time of submitting the form, you will be given an application number which you should keep it safely as you can use it later to track the status of your application. Upon successful verification, your Assam Voter’s ID Card will be send to you by post at the address you have provided on the form. If you want you can also collect it in person from the election office. A lot of documents are required while applying for a Assam Voter ID Card Keep the below mentioned documents handy for a hassle – free application process. Proof of address which includes Aadhaar Card, utility bills, bank passbook, passport, driver’s license, birth certificate etc. If you want to search by details, you will have to provide your name, father / husband’s name, age or date of birth, gender, state, and district and assembly constituency. Select either of the ways and enter the captcha code and click on “search” to generate your results. Also note that, the facility to track Assam Voter ID Card Status Online is not currently available. For further query regarding this, you can call in ECI helpline number which is 1950 toll free. This helpline is available on all working days between 10:00 am to 05:00 pm. In case you have lost your original Voter ID Card, Election Commission in Assam provides the facility of duplicate Voter’s ID Card. Visit the nearest electoral office and ask for Form EPIC – 002 (Form to apply for a duplicate Voter’s ID Card). Fill in the form carefully and attach the supporting documents and also attach a copy of FIR in case if you have lost your original Assam Voter ID Card. In case of damage to your card, submit the card along with the application form. A Booth Level Officer (BLO) will pay visit at your residence to verify the information you have provided. In case of successful verification a duplicate Voter ID Card will be issued to you. Election commission in Assam provides online method as well to get duplicate Voter’s ID card in case you have misplaced or lost it. Visit to the official website of Election Commission and download the Form EPIC – 002. In case of any error or misprint in your voter ID card, you should immediately update the information in your voter ID card as this card also works as your proof of identity. For offline process, you have to complete the procedure in person. Hence, visit the local electoral office and ask for a copy of Form 8. In case you want to correct your name in the card, you are required to provide the proof of your name in the form of a passport copy or any other official government gazette or any other recognized document with the changed name. And submit the form to the present officer in the electoral office and upon submitting the form you will receive an acknowledgement slip. Once verified the information you have provided, your voter ID card will be updated and sent to you at the place of your residence. Election commission in Assam provides online facility to make corrections in your voter ID card. In case you need to correct any details in your voter ID card, you should make it done without any further delays as this card works as your identity proof as well. Go to the official website of the Assam Chief Election Officer and click on the “Download Forms” and select Form 8, which is the application form for correction of details in Voter’s ID Card. Download and print the form and fill it properly and most importantly mention the details you wish to correct. In case of change of name, attach the supporting documents such as passport, or official government gazette copy along with the application form. In case you have changed your place of residence, you should update your new address in your Voter ID card as well. Visit the local Electoral Office and ask for Form 8A. And upon receiving the form, fill in the form properly and attach supporting documents regarding the same and submit the form to the nearest electoral office. A Booth Level Officer (BLO) will pay you a visit at your home to verify your address. One of the most convenient methods to update your voter ID card is by updating it online. Visit the official website of the Chief Electoral Officer in Assam and click on the download form option in order to download Form 8. Download Form 8 and take out a copy of the form and fill it properly. Support the form with required documents to the nearest electoral office in your current place of residence. A Booth Level Officer (BLO) will visit your home to verify your address and details. Once the verification process is complete, you will receive a voter ID card with the changed address. India is the largest democracy and is the second most populated country in the world. The constitution under article 326 guarantees every individual the right to vote and take part in elections. The Voter’s Identity card which is also called the Electronic Photo Identity card or the EPIC card is issued by the Election Commission of India to have accuracy in the Electoral roll and prevent cases of electoral fraud. It comprises of details like the applicant’s Name, signature, photograph, fingerprint, date of birth, address etc. The Chief Election Commissioner of Tamil Nadu is Mr. Rajesh Lokhani who sits in St. George office in Chennai. In this article, we will discuss the Application Process for getting a Tamilnadu Voter Id, Eligibility Criteria and How to track the Application Status? Those applicants who have reached 18 years of age or above can apply for a Voter ID card. Applicant should be an Indian citizen. Applicants who are bankrupt and who belong to a special category cannot apply for a Voter ID card even if they are 18 years of age. Tamil Nadu is the Southernmost state of the country. The literal meaning of Tamil Nadu refers to “Tamil Country” or “the land of Tamils”. It is one of the largest producers of rice, textile, leather and ranks third in terms of Foreign Direct Investments approvals in the country. It is the sixth most populous and eleventh largest state in India. It is one of the most politically active states in India. In 2016 Assembly polls more than 73% voters turned out to vote. In order to participate in elections, the voter’s ID card is mandatory. The Voter ID card in Tamil Nadu can be applied either via the online method or by the offline method. The details of both the methods are given below. Visit the official website of CEO Tamilnadu http://www.elections.tn.gov.in. Scroll down to find the “Online registration facility.Check Out“. You will be redirected to a page which will comprise an application form 6. Fill in all the personal details in the form like Name, Date of Birth, Gender, Address etc. Upload supporting documents like Address and Age Proof. After this submit the completed form. After successful submission, a verification code will be sent to the registered mobile number. Fill the code in the appropriate box provided for it. After this, the site will send an Identity Code for your respective voter card. You can check the status of your Voter ID card with the help of this Identity code. Usually, it takes 40 to 60 days for your Voter ID card to reach your house via post. In the offline method, the applicant is required to submit form number 6 along with the necessary documents at the nearest electoral office. 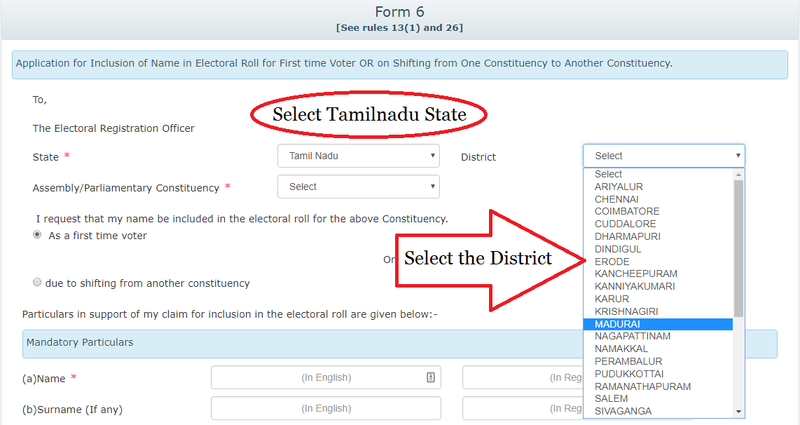 The form can be either downloaded from the official website of the Tamil Nadu CEO or can also be availed at the designated election offices or download it here. The form must be filled along with the necessary documents for verification. Once the documents are verified and reviewed the Booth Level Officers will visit the residence of the applicant to verify the information provided. The issuance of a duplicate card will require you to produce a FIR from the police station that will prove the loss of the Voter ID card. The FIR must be filed along with an application form containing the name, date of loss, voters ID card number etc. Once the FIR has been filed, form number 002 must be filled for applying for a duplicate Voter ID card, download the Form 002 here. Complete the form and submit it along with the necessary documents to the nearest Election Commission Office. The application will be reviewed and the documents will be verified within a week and a new Voter ID card will be sent to the applicant’s residence. Visit the official website of Tamil Nadu CEO. Go to the “Services” section and click on “Electoral Services“. On clicking a new page will open where various services will be displayed click on “Application Tracking“. The application can be tracked with the help of the application ID or your registered mobile number. After this, click on “Track status” to view the status of your application. The status of your application can also be tracked by sending an SMS in the following format, EPIC Voter ID Number and then send it to 9211728082. You can also call the dedicated ECI call center to check the status of your application. The ECI number (1950) is toll-free and is available between 10 am to 5 pm on all working days. Read about How to link Voter ID Card with Aadhaar Card.